• Rio Grande: Kathleen (Maureen O’Hara) sees her husband again after fifteen years’ willful separation; preparing for dinner, she opens the silver chest and hears it play “I’ll Take You Home Again, Kathleen”—and Ford’s focus ebbs delicately away…. 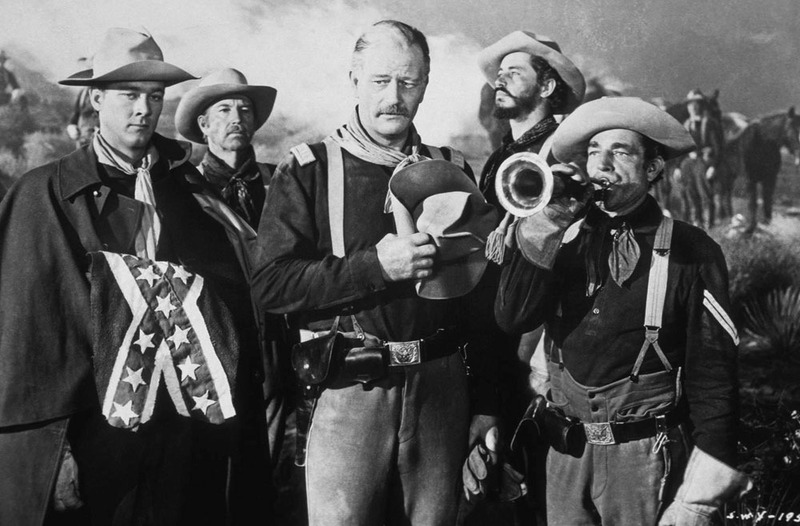 • The death of Hatfield (John Carradine) in Stagecoach: Ringo (John Wayne), having run to the coach door in exultation over their rescue, looks bewildered on the other young man whose youth was blighted; beyond Ringo, a bugler blows Recall…. 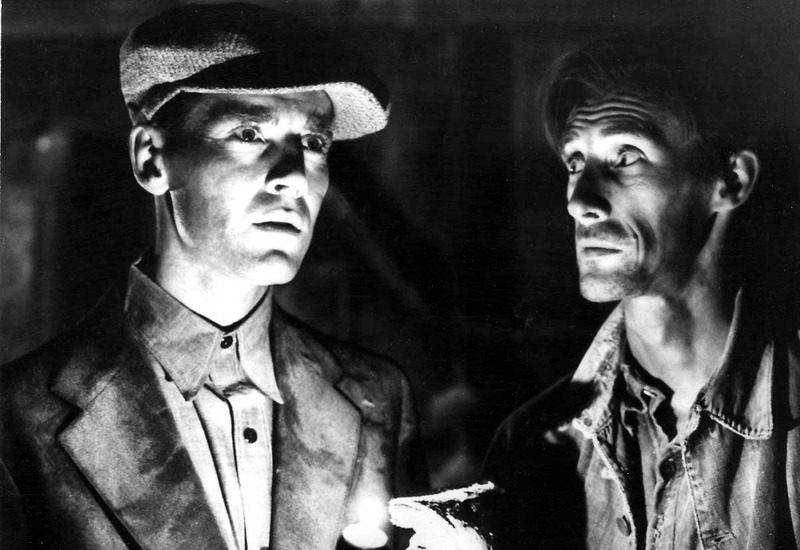 • Abe Lincoln (Henry Fonda) and Ann Rutledge (Pauline Moore) in their one scene together, Young Mr. Lincoln: behind Ann, a tree bough seems to grow right out of her and curve to shelter and bless—but not quite to touch—the gangling frame of one of Ford’s most evocatively disprized heroes…. • The mother (Henrietta Crosman) reluctantly receiving the bouquet from her unacknowledged, illegitimate grandson before beginning her Pilgrimage to her son’s European grave: the flowers are extended up toward that rigid arm lying along the train window; after a moment, it awkwardly reaches down and accepts them; the train begins to move and draws the arm and the window out of frame. The camera never moves; the mother’s face is never seen…. • Judge Priest: Juror No. 12 (Francis Ford) making a round-the-corner shot into the spittoon that the sheriff (Louis Mason) has done his utmost to conceal; he describes the trajectory with an eloquent hand and then gestures proudly at his Confederate sharpshooter medal…. • Ditto (Edward Brophy) stomping desperately at his hat as if it were the candidate who has just defeated Skeffington (Spencer Tracy) at the polls in The Last Hurrah: His Honor quietly molds both “the hamburger” and Ditto back into shape…. • Barry Fitzgerald dumping a hatful of ale on his head when he sees the preacher has joined the party—How Green Was My Valley..
• Young Mr. Lincoln: Lincoln and Efe Tyler (Eddie Collins) riding on muleback along the river Abe identifies with Ann: lost in reverie, Abe picks a tune on his Jew’s-harp that turns out to be “Dixie”—of which he and Efe wholeheartedly approve…. 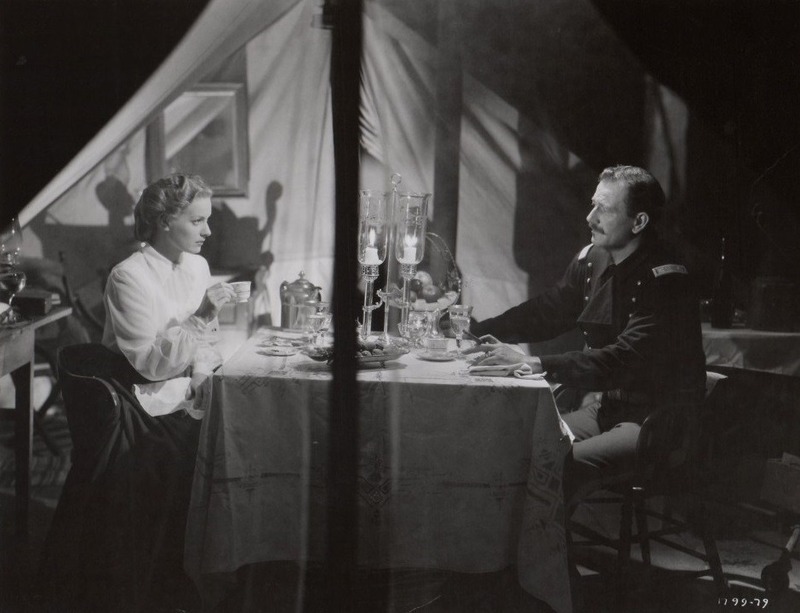 • Kirby Yorke (John Wayne) in Rio Grande returning wearily to his tent after a sortie, lighting a lamp to find Kathleen keeping watch on the night: in one powerfully self-contained motion he sets down the lamp and embraces her…. • Zeb Rawlins (George Peppard) marching off to “The Civil War” in How the West Was Won: he sends back the farm dog that tries to follow him down a road between split-rail fences, full of shadows and mystery and death, as “When Johnny Comes Marching Home” sounds softly over all…. “Academy haters said it was not seismic waves that caused the disastrous earthquake of 1933. It was the roof falling in on the producer-controlled Academy. At any rate, it was just before a meeting of the Academy-Company committees that the earthquake hit. I was having my hair cut in the basement barbershop of the Hollywood Athletic Club, when the building rumbled and rolled. In two seconds I was outside with dozens of others, watching its tall tower swaying and cracking. Swallowing my heart I went back in for a steam bath to calm my jittery nerves. In the foggy steam room I found a lone occupant, calmly reading a paper: a tall, dour-looking bloke with a black patch over one eye. I looked at his legs to see if he had a peg leg, à la Long John Silver. No peg leg. 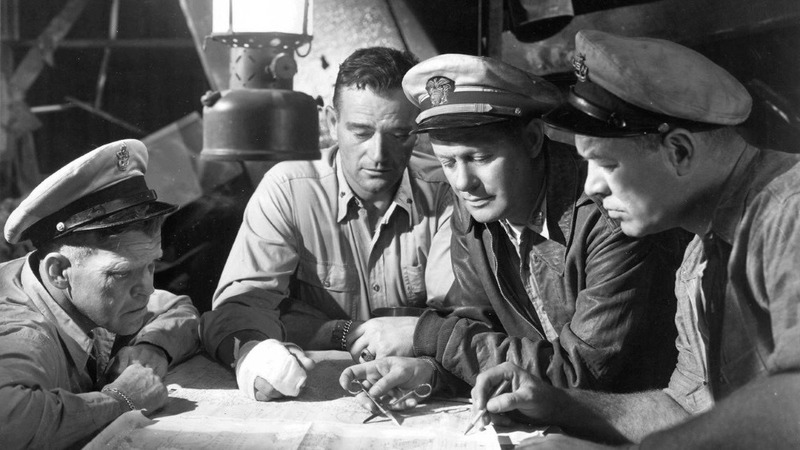 John Ford: “Well, that’s a presumption I can’t accept. I never felt that way about it. I’ve always enjoyed making pictures—it’s been my whole life. I like the people I’m around—I don’t mean the higher echelons, I mean the actors, the actresses, the grips, the electricians. I like those people. I like to be on the set and, regardless of what the story is, I like to work in pictures—it’s fun. • They Were Expendable: Russell Simpson, The Grapes of Wrath‘s Pa Joad, sitting down on his stoop in the Philippines with a rifle and a jug and the grim determination that the Japs are going to fight to get his land. 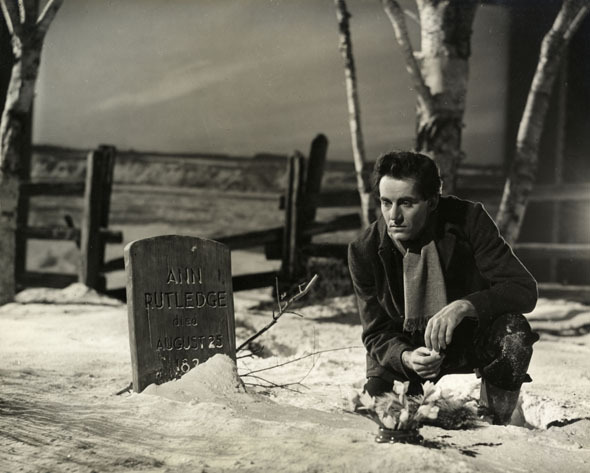 Leaping across years and films to underscore the rightness of his cause, “Red River Valley” settles over the scene…. • Editor Dutton Peabody (Edmond O’Brien, in the clothes of Doc Boone and one of the alternate names of Peacock the whiskey drummer) reeling drunkenly about his newspaper office in The Man Who Shot Liberty Valance: advising the ghost of Horace Greeley to “go west, old man, and grow young with the country,” he blows out the lamp and lurches offscreen to become a shadow, as, from somewhere, a girl sings sweetly in a language he does not know…. • Fort Apache: the Apaches, having ridden over Thursday’s command, roll on toward the ridge; Yorke strides out to meet them; the great cloud of dust catches up and shrouds everything as we hear a lance sink in—what?… There is a rumble of the Indians riding away, and the dust thins to reveal Yorke standing beside the war lance buried in the ground…. • They Were Expendable: the explosion of Ryan’s PT boat in the surf and the artificial “rainfall” that lashes at the men on the beach; Ryan sits down heavily in the sand, staring, and Ensign Gardner (Marshall Thompson) wishfully retrieves the radio antenna, which becomes an accidental Cross…. • A colt springing up on the westward bank of the river midway through Wagon Master: Ford will reprise the shot at the end and that colt will carry the emblematic weight of a new nation on its spindly legs…. • Life goes on in Tombstone, My Darling Clementine: the arrival of the morning stage becomes a key event in the gunfight at the OK Corral, as Earp steps around a wagon, hoists his foot onto the tongue, lifts his gun by the drum and says, “Let’s talk a while”…. • The ending of Ford’s personal favorite film, The Sun Shines Bright: Judge Priest (Charles Winninger) goes into the house “to get my heart started”; Jeff (Stepin Fetchit) stays on the porch to play his mouth organ as the light in the hall goes out—for reasons that have nothing to do with realism—and an inner light beams forth…. • The ending of 7 Women, Ford’s last film: Dr. Cartwright (Anne Bancroft) hears the poisoned Khan (Mike Mazurki) fall dead behind her; smiling bitterly at the tragic fulfillment she has won for herself, she tosses off her own cup, as the camera recedes and—for reasons that have nothing to do with realism—darkness engulfs the screen…. Men like my father cannot die. 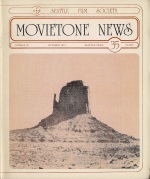 This tribute to John Ford shortly after his death was a collaboration by Richard T. Jameson, Kathleen Murphy, and András Fürèsz. The pictures chosen are a big part of it; check out the pdf. Erratum, but not really: For decades, and certainly at the time of Ford’s death, 1895 was understood to be the year of his birth—hence the subtitle on this feature. Subsequently it was determined that he was born a year earlier, in 1894. John Ford resisted definition any way you look at it.